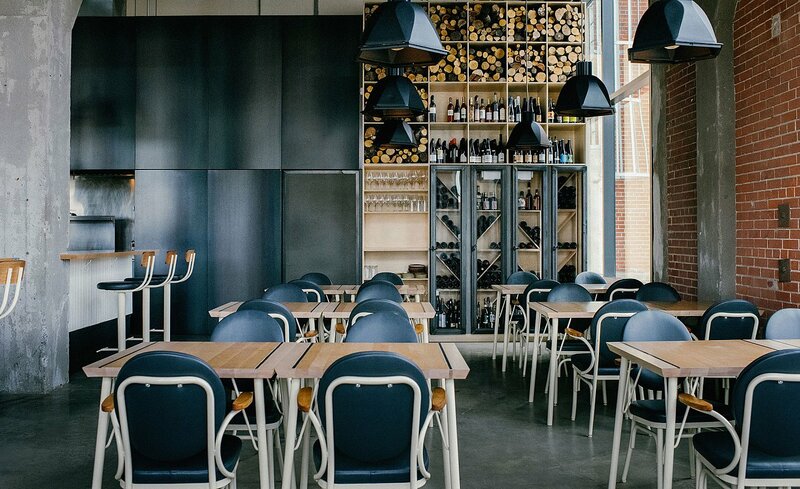 At the Hoogan et Beaufort restaurant, located in a former train manufacturing factory in Montreal, Canada, both the new and the old are celebrated in a stylish contemporary space that pays homage to the heritage of the building. The interior was designed by APPAREIL architecture and features a refined combination of modern and traditional. The 28-foot-high ceiling and various industrial details provided the perfect opportunity to create a distinct design for the 70-seat restaurant. At the center, the open kitchen beckons the guests closer to have a seat at the bar which overlooks the chef’s work area. “We wanted to recreate the festive atmosphere that is found around a bonfire,” explains architect Kim Pariseau. The original industrial features include exposed brick walls, large beams and ceiling tracks, which the studio enhanced by using wood, steel and concrete materials along with various refurbished items. Local artisans provided custom-made furniture, while restaurateur-designer Alexander Baldwin designed eye-catching lamps and retro-inspired chairs. The result is a restaurant where guests can enjoy a good meal and good design in a warm, comfortable and elegant space. Photography by Alison Slattery.